After a very long and exciting first day at ISTE I found myself back again for more. This day I had a better understanding of where everything was and also what I wanted to attend. I spent the first part of the morning once attending poster sessions and then jumping into the expo. I was excited to wander through the expo and see new products but also see favorites that I use in my classroom daily. I stood in line for what felt like a long time. In order to try and get a free book from Kasey Bell. However, I literally was the cutoff. I was that one person who wasn’t going to get a book, darn. Well I kept pushing and with a little bit of coffee ended up finding Pear Deck, Wonder Workshop, and Lalilo. It was nice to be able to get hands-on learning and talk to the people who know the product the best. So excited to find these ribbons! Pear Deck was one of the places that I was excited to go. I dabbled in it prior to ISTE, but did not use it. After hearing about the added features, uses in the classroom, and seeing the possibilities reminded me of why I started using it. This showed how it can be used with Google as an add-on extension. It is easier than ever to create slides and use Pear Deck to get students further involved in the lesson. I got so excited and can’t wait to use this going into this next school year. Lalilo was one of those booths in ATT’s Pitch area. I had never heard of it prior to ISTE and after them giving us a handout my colleagues and I wanted to learn more. It is still in the Beta testing stage, but it is a free online program that focuses on the primary skills. The skills of reading, word recognition, sounds, blends etc. Now you may wonder why this would be something important to me? Well even though I am in 5th grade I do have students who have IEPs and struggle with some of these skills. I also have ELL students who are the first generation. They are learning English after traveling from the DRC (the Dominican Republic of the Congo). This is a site that a few of my students could use, but I can also share them with other teachers at my building (as well as all of you!). After spending an hour at the Expo we made our way to the Ditch That Panel. At this panel, we would hear how educators are taking on Matt Miller’s ideas and utilizing them in their school or classroom. I remember getting in line and some people coming up and asking what we were in line for. This was because the line was so long, after answering many chose to leave. To be honest, once we headed into the room it wasn’t bad at all. People get defeated before they try. One thing I realized is that many people see a line and freak. You have to remember the doors don’t open until 30 minutes till so if you get there 30 minutes before you should be good. Patience People! Regardless we got seats and in all honesty, I thought we were at a teacher concert. The lights, the stage, and giant screens got my energy up and excited and the show hadn’t even started yet. Once again the presenters were out in the audience. They were passing out stickers and getting people excited for the presentation. I even got to talk to Tara Martin who walked by and like my shirt. The previous night, I had gone to her book launch party and I bought an R.E.A.L. shirt and her book. I’m currently reading it but I’m so excited to share once I’m done!). Once the show got started it did not disappoint. There were eight different people on the stage. They all were so well informed on Ditching that Textbook in their line of work. It was awesome to hear how teachers, administrators, and tech advisers were ditching the textbook. An important takeaway was the collaboration and connection between classes with technology. Once two teachers talked about how they connected their classes, I immediately tweeted about wanting to connect my class to other classrooms. I have wanted to do this before but it has been difficult. Luckily with Flipgrid and many other apps, it is easier. My hope is that Twitter will pull through and make this year awesome and full of connections for my class. Following this experience, we spent some time eating and wandering the expo hall. I ended up wandering upon two awesome booths. One I knew about and was excited to see their product. It was Qball by @peeQ. I had seen the product on Facebook and was so excited about the possibility of adding it to my classroom. It is a microphone ball that can be thrown. It allows someone to speak into it and it amplifies in the classroom via a speaker. I have looked at this tool many times but never held one before. I saw the booth I ran straight there. I wanted to get my hands on one of their Q-balls and they were so welcoming and willing to let me try it out. I wasn’t expecting them to be so soft and light to be honest. I worried about them hitting the floor. I felt at ease. The people at the booth said that it would be fine. They have worked on it to make it safe and make it possible to handle wear and tear. The other booth I never heard of before was Woot Math. This booth I stopped at to drop off a raffle sheet but in the process, they gave us a quick rundown of their program. My building is departmentalizing this year. I am taking over math for my entire grade am very open to any math resources. I loved that it was free for teachers to use. There seems to be a formative assessment tool and also adaptive practice for students to practice skills. They can import your class roster from Google Classroom and get them started. They have a dense problem bank based on the Common Core Standards and I’m excited to try it out this year. I will say so far I am impressed with their customer service. They are willing to answer questions and help you get started. I then made my way to the Sketchnoting session: Visualize. Connect. Doodle. 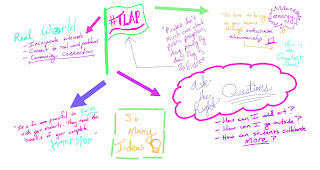 Repeat: Sketchnoting to Enhance Learning with Explain Everything. This session was put on by Carrie Baughcum @heckawesome and Dana Ladenburger @dladenburger. 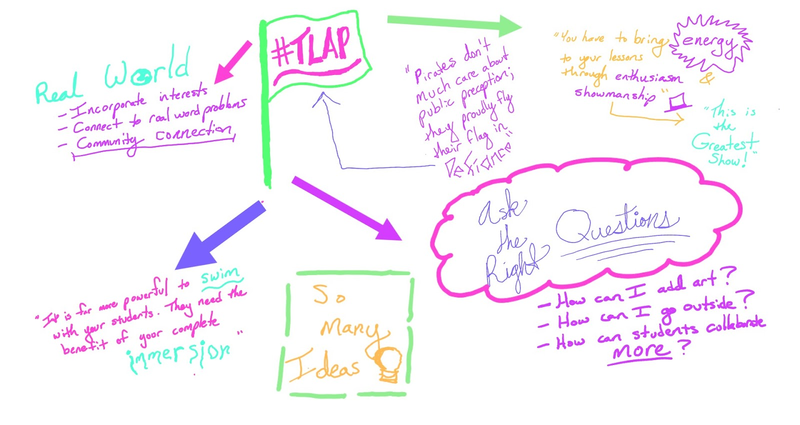 This session was focused on the basics of sketchnoting and how to get started using the app Explain Everything. I have always loved drawing and even doodle when in meetings. When I heard about the idea of sketchnoting this past year I was interested. Yet never made the time to learn more. I wanted to attend this session because I wanted to learn more about it, but also just try it out. It was a nice session to end the day on because I was drawing and writing in a quiet room. This was peaceful and almost put me in a meditative space. I had never noticed how much sketchnoting I already do in my notebooks, but found ways to improve. For me I know I need to find other fonts I feel comfortable with and practice them more. I also need to create an icon vault. I have to create and practice different icons that I can use when I am taking notes. Explain Everything is an app that I had never heard of prior to going to this session, but after using it I am excited to use it more on my new 360 laptop. I came home after ISTE practicing my sketchnoting skills. I even created one based on what I was reading in Teach Like A Pirate. It wasn’t the greatest, but I realized after tweeting it out and tagging our presenters I have entered a whole new community. I have gotten so much support over my sad drawing, first Sketchnote and Carrie messaged me to give me some tips. I am so excited to take what I learned and practice moving forward. This session was more for me as a person, but I now am open to teaching my students when taking notes in class. This concludes my awesome second day at ISTE. What is something you are learning for yourself? Can you/ have you brought it into the classroom? What is one new resource you found recently? Check out our Facebook page and my Facebook Group! This post makes me just all kinds of happy. Happy remembering having you at our session. Happy to see you reflecting, remembering your learning and sharing your story. Your reflection of learning with us makes my heart just explode. To know that the ideas connected with you. To hear all the feeling and reflections it brought to you as a learner and now sketchnoter just means the absolute world. I’m also all kinds of giddy to have continued to connect with you and talk and share all that sketchnotiness with you. Super stolked to hear about where sketchnoting takes you and your students. Also, be sure to check out all of explain everything’s tools. It has incredible potential and power for your teaching and student learning. Great reflections and reminders too about patience when getting to sessions. I also was at Tara's book launch party, great to see so many friends there and meet new ones.. Her book is amazing and Carrie's drawings are out of this world!